Talk about a bucket list: here are natural wonders-the dazzling glowworm caves in New Zealand, or a baobob tree in South Africa that's so large it has a pub inside where 15 people can drink comfortably. Architectural marvels, including the M.C. Escher-like stepwells in India. Mind-boggling events, like the Baby Jumping Festival in Spain, where men dressed as devils literally vault over rows of squirming infants. Not to mention the Great Stalacpipe Organ in Virginia, Turkmenistan's 40-year hole of fire called the Gates of Hell, a graveyard for decommissioned ships on the coast of Bangladesh, eccentric bone museums in Italy, or a weather-forecasting invention that was powered by leeches, still on display in Devon, England.Created by Joshua Foer, Dylan Thuras and Ella Morton, ATLAS OBSCURA revels in the weird, the unexpected, the overlooked, the hidden and the mysterious. Every page expands our sense of how strange and marvellous the world really is. And with its compelling descriptions, hundreds of photographs, surprising charts, maps for every region of the world, it is a book to enter anywhere, and will be as appealing to the armchair traveller as the die-hard adventurer.Anyone can be a tourist. 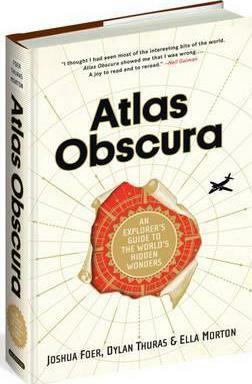 ATLAS OBSCURA is for the explorer. I thought I had seen most of the interesting bits of the world. "Atlas Obscura" showed me that I was wrong.It's the kind of book that makes you want to pack in your workaday life and head out to places you'd never have dreamed of going, to see things you could not even have imagined. A joy to read and to reread. NEIL GAIMAN, author of "Sandman "and "American Gods" "Atlas Obscura" is a joyful antidote to the creeping suspicion that travel these days is little more than a homogenized corporate shopping opportunity. "Here are hundreds of surprising, perplexing, mind-blowing, inspiring reasons to travel a day longer and farther off the path... Bestest travel guide ever. MARY ROACH, author of "Stiff "and "Gulp" "Atlas Obscura" may be the only thing that can still inspire me to leave my apartment... This resource is essential for exploring the world and engaging adventure with wit and style (often from the comfort of my bed). LENA DUNHAM, creator of "Girls "and author of "Not That Kind of Girl" My favorite travel guide! Never start a trip without knowing where a haunted hotel or a mouth of hell is! GUILLERMO DEL TORO, filmmaker, "Pan s Labyrinth" What a strange and wonderful book! It is as curious and surprising as Saddam Hussein s very own Blood Qur an written in his own blood which I would never have known about had I not read the amazing "Atlas Obscura." JON RONSON, author of "So You ve Been Publicly Shamed" This book is as curious and enthralling as the world it covers. Each page reveals some hidden realm a realm that is frightening, or funny, or magical, or simply mad, but that always leaves the reader in wonder. DAVID GRANN, author of "The Lost City of Z: A Tale of Deadly Obsession in the Amazon" Your peregrine falcon needs a small talon trim? Go straight to the Abu Dhabi Falcon Hospital... Be grateful when visiting the Karni Mata Rat Temple if one of the 20,000 venerated rodents runs across your bare foot it is considered good luck... You won t be able to enter the 20-years-in-the-making and still abandoned tallest hotel in the world. It does not matter. Wherever you look around Pyongyang, North Korea, the 105-story skyscraper silently towers over all... Life is short. Our planet is filled with curiosities and marvels ... and this wondrous book is your guide! PHILIPPE PETIT, high-wire artist and explorer A travel guide for the most adventurous of tourists ... a wonderful browse [for] armchair travelers who enjoyed Brandon Stanton s "Humans of New York" and Frank Warren s" PostSecret." "Library Journal" "
Joshua Foer is the cofounder and chairman of Atlas Obscura. He is also the author of Moonwalking with Einstein: The Art and Science of Remembering Everything, a bestseller published in 33 languages, and a forthcoming book about the world's last hunter-gatherers. Dylan Thuras is the cofounder and creative director of Atlas Obscura. Ella Morton is a New Zealand-born, Australian-raised, Brooklyn-based writer, focusing on overlooked aspects of history and culture. After covering consumer technology at CNET she hosted Rocketboom NYC, a web show about New York's quirkier people and places. Her most popular interview was a chat with Cookie Monster on the set of Sesame Street. Ella was associate editor at AtlasObscura.com, where she wrote about such topics as tobacco smoke enemas, Victorian streaming music services, and the etiquette of marrying a ghost.